Drop in the evening, use in the morning- already part of your daily routine! Hearing loss is an ageless phenomenon and therefore the ability to have a hearing aid device that can be easily used by all segments is imperative. Disposable batteries are an incredible hassle that require constant changing and even more frustrating is the fact that battery frequently runs out of use in the middle of the day. To improve the user experience and alleviate a real pain point, users need an easier charging solution, however in a small device such as a hearing aid a USB cannot be the provided solution. seamlessly integrated. This eliminates the need for dexterity and improves the user experience dramatically. For those experiencing this daily struggle, the change is priceless. As hearing aids continue to evolve, they will be able to perform more functions that will require more power. This will make it ever more difficult to rely on disposable batteries. Therefore the inevitable direction is to find an adequate wireless charging solution. Humavox’s NEST wireless charging station provides an easy to use charging solution for hearing aids. The charging station was developed with hearing aids users in mind, therefore it provides an extremely convenient and intuitive wireless charging experience for people of all ages. With Humavox’s hearing aid charging station you can simply “drop and charge” the device into a bowl or a box and have it charged during the night, without handling cords, batteries or complicated charging instructions. 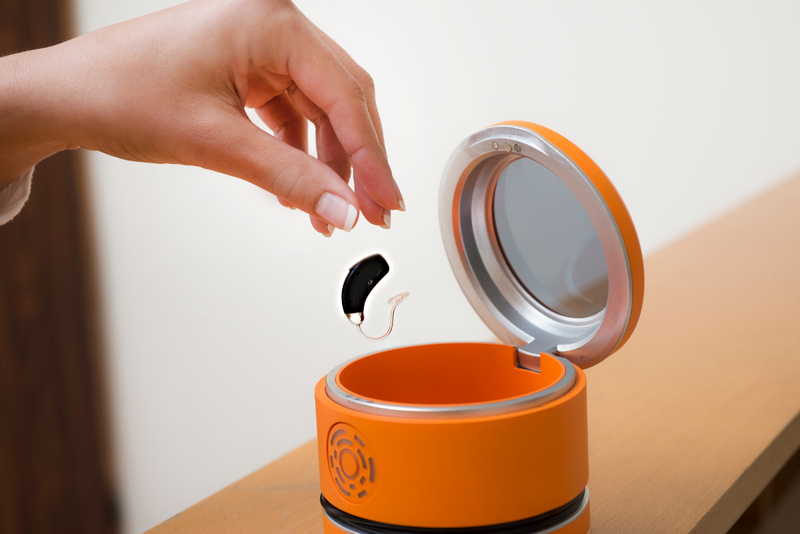 Whether young or old, one should be able to depend on their hearing aid device and be able to easily charge it. Without battery running out in the middle of the day, without the hassle of dealing with those small disposable batteries and without the inconvenience of cables. Making charging a natural, instinctive, intuitive and easy experience is Humavox’s approach. Before bed, users simply take their hearing aid off and throw it into a Humavox charging station- no strings attached. If you are a hearing aid OEM and interested in integrating wireless charging into your device in order to provide consumers with an easy and natural charging experience, please feel free to contact us.